Please accept my blessings. I am so much pleased to receive your letter dated Hrsikesa 22, 484 Caitanya Era and I am so glad to learn that our London Temple is very, very well managed under your supervision. Kindly continue this standard of Temple management--that will make me very happy. Here in India I am trying to establish a branch. We have come here eight strong Vaisnavas and Tamala Krsna is also with me. We are getting encouragement and there is similar situation in New York and other U.S. cities. Yesterday morning Tamala along with other two devotees went to the downtown quarters and they immediately gathered about five hundred men and collected 25 rupees also without any magazine or literature. Books and magazines worth about $60,000 are coming from Tokyo very shortly, then we will have vigorous preaching work in Calcutta. We are already in a very nice house, five stories, and we are getting another still better house in North Calcutta. The program executed by you on Janmastami and Nandotsava Days appears to be very nice and I am so glad that you remember my childhood name Nandu given by one of my uncles. Regarding your program of duties for the brahmacaris and brahmacarinis and grhastha men and women, this is a very nice arrangement. The girls should manage internally and the boys should manage externally. So all of you have my hearty blessings for your kind service to Lord Krsna. Be always engaged in this way and become happy. I understand that Syamasundara. and Gurudasa are appointed to oversee the European centers in the absence of Tamala Krsna, so ask them to send reports once in a fortnight. I am very anxious to see our Back to Godhead printed in French and German languages just like our English language edition. I have received the news clippings sent by you. These articles are very nice. I have seen and I am showing everyone who comes to me. Please accept my blessings. I beg to acknowledge receipt of your letter dated August 31st, 1970, and noted the contents. I am very glad to know that the GBC is actively working to rectify the subversive situation which has been weakening the very foundation of our Society. All you members of the GBC please always remain very vigilant in this connection so that our society's growth may go on unimpeded by such poisonous elements. Your preaching in New Vrndavana as well as intensified study of our literatures with seriousness is very much encouraging. Please continue this program with vigor and reestablish the solidity of our movement. From the very beginning I was strongly against the impersonalists and all my books are stressed on this point. So my oral instruction as well as my books are all at your service. Now you GBC consult them and get clear and strong idea, then there will be no disturbance. Disturbance is caused by ignorance; where there is no ignorance, there is no disturbance. The four Sannyasis may bark, but still the caravan will pass. There is every evidence that they are influenced by some of my fourth-class Godbrothers. Regarding India, first of all I am trying to fix up a center in Calcutta and then I shall call you as your presence is needed. In the meantime go on constructing New Vrndavana. If there is opportunity, try to convince these rascal Sannyasis who are misled by fourth-class men that if they at all want to have a change of leadership why do they not select a better leader than at present moment. What is the use of finding out a fourth-class leader who has no asset as their background. I am simply sorry that such intelligent boys are misusing their brain-substance in this way. Try to rectify them as far as possible. Isana Das has inquired from Tamala regarding Tirtha Maharaja. I do not know what is the sequence of this inquiry, but it is clear that there is a great clique and the so-called Sannyasis are the via media of spreading contamination in our Society. It is a very sorry plight. Please accept my blessings. I beg to acknowledge receipt of your letter dated August 31st, 1970, and noted the contents. I am very glad to know that you are travelling to Portland, Oregon, with some other devotees for the purpose of establishing a new center there with the help of Syamasundara.. That is very encouraging news. I am so glad to learn that you are having nice success in placing my books in the libraries and in schools and colleges. That is very much to my satisfaction, so please continue your program for placing these Krsna Consciousness literatures in all the libraries and schools and colleges. I am sure that this will revolutionize the thinking of the thoughtful men of your country as well as the students and professors and the ultimate end will be to save the world from the clutches of material illusory activities which is now causing havoc everywhere. It is a great encouragement to me also that the GBC is carefully revising the program of our temples in view of the recent attacks upon our Society. I am very much counting upon you all to keep the standard of Krsna Consciousness as I have already instructed you both orally and in my literatures. I have received one letter of statement from Dai Nippon Printing Company that the ``Bhaktivedanta Book Fund Deposit'' has been credited with $10,000 up to the 29th of August, leaving a balance due of $22,100. I have advised them of your last check No. 225 dated August 29th for $1,500. So please continue to send them checks as you are doing so that they may receive another full $10,000 before shipment is made. This will leave still another $12,100 balance due from the original total of $32,100 which may be payed up after the shipment is made. Regarding the packages sent to me in Los Angeles, if there is any sweets etc. they may be distributed among the devotees and so far clothes are concerned they may be kept in my wardrobe there for me. If there are any clothes for my Deities, however, they can be sent here by Air Post. Regarding the four Sannyasis, I have already written to them in care of the Detroit temple requesting them to not preach anything which may hamper the growth of our Society. But I have not received any reply from them. Please try to help these boys and advise them on my behalf not to waste time in such fruitless endeavor. I hope in the meantime I shall receive their reply by the grace of Krsna. Yes, I am so glad that your center is doing so well and all the devotees are now appreciating the presence of their Spiritual Master by following His instructions although He is no longer physically present--this is the right spirit. Please keep me informed of your activities regularly. Please accept my blessings. I beg to acknowledge receipt of your two letters dated August 30th and September 4th 1970 and it appears that the arrangement for distributing books in the libraries of schools, colleges and universities as well as public libraries is very satisfactory. Do everything conscientiously and Krsna will give you all necessary intelligence. In India our preaching work is going on. Practically everyday we have got an outside nice meeting. There is regular newspaper coverage, but the difficulty is that the whole country is now communist infected. People are in very much perturbed condition. All of them are expecting me to do something for ameliorating the situation, but I am simply advising them to chant Hare Krsna because this transcendental sound is the only panacea for all material diseases. I am receiving many astounding letters regarding the new propaganda work by our four Sannyasis. I do not know why these boys are doing such nonsense and wasting their time. I received their letter from Detroit about a week ago and I have replied them duly intimating therein that instead of wasting time in that way let them work constructively. Please advise them on my behalf not to waste time in such fruitless endeavor. I hope I shall receive their reply by the grace of Krsna in the meantime. Now I have invested the GBC for maintaining the standard of our Krsna Consciousness Society, so keep the GBC very vigilant. I have already given you full directions in my books. Please counteract this contamination which has been spread throughout our Society. Regarding the printing of the serialized chapter by chapter books of the Second Canto, why stop it. Let it go on as it is, do not stop it. We may suspend the Japanese printing for now. You have written to say that it seems in general that ISKCON Press is being taken over by Dai Nippon as far as satisfaction of our needs, but there is no such question at all. 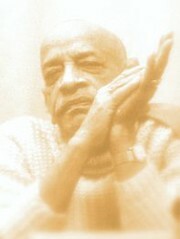 ISKCON Press must continue and expand also. So far the 5,000 copies of Nectar of Devotion are concerned, there is no sufficient money just now, so this may be stopped for the time being. I am very glad to know that you are not affected by the propaganda of the Sannyasis that I am displeased with all the members of the society--I am never displeased with any member. I hope this will meet you in good health and please offer my blessings to Srimati Jadurani whom I am so glad to hear is well and working on the paintings for Bhagavatam.